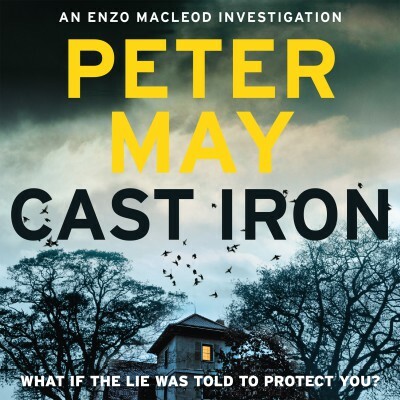 Cast Iron – Peter May – Audible Book Review by Pat V.
Cast Iron is the sixth and final novel by Scottish crime writer, Peter May, featuring his forensic scientist sleuth, Enzo Macleod. Though set in the south-west of France, Macleod is half-Italian, half-Scottish and works as a biology professor at a French university where he applies the latest scientific methods to solve crimes. In the first novel of the series, Extraordinary People, he made a bet with a local police chief that he could solve seven notorious French cold cases described by a Parisian journalist, Roger Raffin. Each novel in the series covers one of the seven mysteries for Enzo to solve, though in Cast Iron we get two for the price of one as the final two cases are resolved. Peter May is probably best known for his Lewis Trilogy, (The Blackhouse, The Lewis Man and The Chessmen) set in the Outer Hebrides, which have sold over a million copies. He has also had great success with six thrillers set in China and with a number of stand-alone novels, the most famous of which is possibly, Runaway, based on his own experiences as a teenager when he ran away from his home in Glasgow to seek his fortune in London as part of a music group. May tells us that Enzo Macleod too has some things in common with his author. Both live in France, are about the same age and physically similar and have a complex personal history. Macleod’s broken marriage and complicated love life features large in these novels. However, when he is described as a cross between James Bond and Inspector Clouseau (of Pink Panther fame) we must assume that, in this regard at least, they are different! Cast Iron begins when the great heatwave of 2003 uncovers the skeleton of a young girl, Lucie Martin, on the dried-out shore of the lake near her home. She had disappeared 14 years before and her parents believe she was murdered by a notorious serial killer who was active at that time, though he had a cast-iron alibi for the time she disappeared. When Macleod’s own daughter Sophie and her boyfriend Bertrand are abducted and he receives a warning to stop his investigation if he wants them back safely, he realises that someone is out to stop him from discovering the truth about Lucie’s murder. Undaunted, he redoubles his efforts to find out what happened, aware that he is in a race against time.